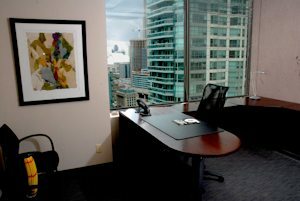 Why rent a serviced office Toronto you might say? Well, you’ll discover many serviced office benefits right away! Giving you more extra cash to have more fun! And it’s not just the savings that will make you decide to stay. 1. Amenities galore we have in store so working will never be a bore. 2. Toronto Boardrooms in a business centre that any client would love to enter. 3. Complimentary filtered water, coffee and tea – it’s always free! 4. Downtown location near the subway and train station. 5. Executive private suites worthy of a thousand tweets. 6. Furniture styles galore exude class when you open the door. 7. High-speed internet is absolutely the best you can get. 8. Instant phone set-up the same day lets you start work right away. 9. Kitchen facilities, fridge and microwave, means money you will save. 10. A quality network laser colour printer that is as fast as a sprinter. 11. Parking is an easy solution – you will avoid ending up in an institution! 12. A reception area that is so stunning, it will keep your clients coming. 13. Office choices where you will never lose, and only pay for what you use! 14. A seminar training room is prudent, whether you are a tenant or a student. 15. Finally you will be blessed, with an office at Toronto’s No. 1 address. With serviced office benefits, including additional cost savings because you only use what you pay for, and optimum work efficiency because staffers look after your day-to-day businesss needs, the question “Why rent a serviced office?” becomes academic. Yes, serviced offices save money – but they do a lot more than that. In a nutshell, a serviced office frees up the time you need to concentrate 100% on your business. Our poet certainly knows this! Why not tour our serviced offices at Telsec?